The one thing that you may miss the most when you first start the keto diet is the sweets. Fortunately, just because you are cutting out the carbs doesn’t mean you have to leave the sweetness behind as well. To satisfy your sweet tooth, all you really need are the right low carb sweeteners — sugar is no longer necessary. Although it is rare to find a keto-friendly sweetener that emulates all of the properties of sugar, there are a handful of low carb sweeteners that you can use to make most of your favorite sugar-laden recipes into keto heaven. However, there is one problem. Each sweetener that you use on keto will typically have slightly different tastes, varying degrees of sweetness, and different properties that can make baking and cooking with them a bit more complicated and confusing (especially when you don’t have the sweeteners that your keto recipes call for). For this reason, we decided to put together a comprehensive guide on keto sweetener substitutions. By using our recommendations this guide, you will be able to satisfy your sweet tooth regardless of what low carb sweeteners use. Near the end of each sweetener’s section, you will find a conversion chart that will sum up all of the ways you can replace it with other popular keto-friendly sweeteners. For those of you who are curious about other sweeteners that aren’t covered in this guide, we provided a couple of sections that show you how to figure out if the sweetener in question is keto-friendly and how you can use it to replace other low carb sweeteners. If you’d like to learn more about each sweetener and why they are used so often on the ketogenic diet, check out our article about the best and worst low carb sweeteners. Conversely, for those of you who want to learn more about how to use and replace common keto sweeteners, continue reading below. The number one question we get regarding our keto baking recipes is if a different sweetener can be used. People often ask if they can replace a highly concentrated sweetener with a granular one, or vice versa. In general, it is best to stick with the sweeteners that the recipe calls for or a sweetener that is similar to it. The problem with swapping highly concentrated for granular and vice versa is that the end result may not have the same texture or consistency. It could fall apart or be too dense, be too dry or too wet, etc. When using a concentrated sweetener instead of a granular sweetener: you will need to subtract some liquid or add more dry ingredients (e.g., a keto flour like almond or coconut) until you get the right consistency. You may need to use a bit extra concentrated sweetener to make up for the additional dry ingredients you use. When using a granular sweetener instead of a concentrated sweetener: for every 1 cup of granular sweetener, add around 1/4 cup of liquid to the recipe slowly and stop when you reach the right consistency. This will be helpful for when you are using granular low carb sweeteners like erythritol or Swerve in place of liquid stevia or sucralose. Note: In this guide, we use the term “concentrated sweeteners” as way to indicate any sweetener that is much sweeter than sugar (e.g., stevia extract, sucralose, pure monk fruit extract). Different sugar substitutes have different levels of sweetness so you can’t replace one with another in the same quantity. If you do, your keto recipe could be too sweet, not sweet enough, or have an awful aftertaste. For example, powdered stevia extract is 200-300 times sweeter than sugar and erythritol is about 60 – 80% as sweet as sugar. Some stevia sweeteners can have a bitter aftertaste while erythritol tends to leave a unique cooling feeling in the mouth after it is eaten. Combining the two, however, tends to remove the aftertaste and emulate sugar pretty well. Below, we will provide you with a sweetener conversion chart and substitution suggestions that will help you get the right texture, taste, and level of sweetness. In each section, there will be a link to take you back up to the chart so you can compare different sweeteners that you may want to use. Keep in mind, however, that there are no guarantees when replacing sweeteners of different types. Our tips are only meant to be a guideline. They may not work perfectly with every recipe, but they will give you a general idea of what you can do to use your keto sweetener of choice. Below you can find a graphical example of the conversion amounts needed when substituting out different low carb sweeteners. Remember that if you are substituting a granular sweetener for a liquid sweetener (or a sweetener than needs much less volume) you may need to adjust the recipe. Keep in mind that granular sweeteners usually add some bulking to the recipes, so they may turn out different in terms of size, taste and texture. If you’re more comfortable with standard text charts, you can also find that below. Feel free to refer back to either to find out how much of each sweetener to use when substituting items. Stevia sweetener is derived from the leaves of the stevia plant. Once the sweet parts of the plant are extracted, they are dried into a powder or suspended in liquid form. Many people also find that they prefer one brand of stevia over another, so it’s worth experimenting to find one that you like. Just make sure the product you purchase doesn’t have any added filler like maltodextrin or dextrose. Due to the difference in concentrations between different stevia products, it is difficult to give you a general recommendation for how to replace it. For the purposes of this guide, we will stick with commonly used liquid stevia and stevia extract powder products. If you do not have the same brand of stevia, the conversions will be very similar as long as there are no other added ingredients in it (e.g., maltodextrin and dextrose, which you should try to avoid where possible anyway). 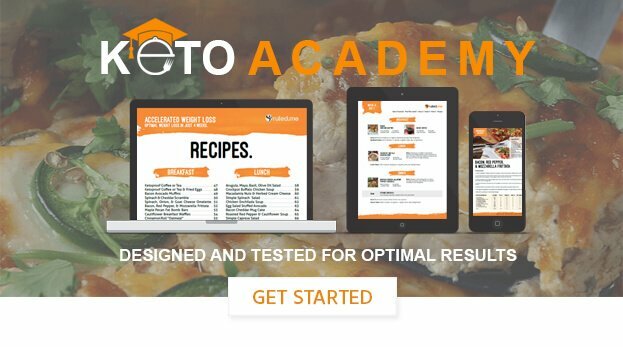 The low carb sweeteners that we selected are the ones that are most commonly used in the keto community and in Ruled.me recipes. When it comes to taste, the sweetener blends (e.g., Swerve, Lakanto Monkfruit Sugar Substitute, Pyure Organic Stevia All-Purpose Blend) tend to be the most pleasant and usually have no aftertaste. * Click here to see sweetener conversion chart. *Remember: You may need to add some extra liquid ingredients when using these granular low carb replacements instead of a concentrated sweetener like stevia. Erythritol is a sugar alcohol naturally found in small amounts in some fruits and fermented foods including wine, sake, beer, watermelons, pears, grapes, and soy sauce. While real sugar has 4 calories per gram and xylitol (another popular sugar alcohol) has 2.4 calories per gram, erythritol is much lower in calories at 0.24 calories per gram. It’s quite sweet still, at about 60 – 80% the sweetness of glucose. Erythritol is safe, may have positive health benefits, and doesn’t cause any side effects for most people. If you have digestive issues, however, you might be more sensitive to it. 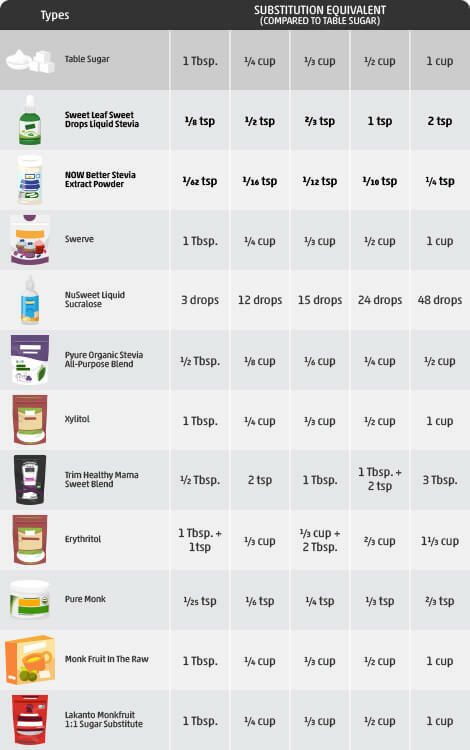 The best erythritol substitute would be one of the granular blends in the table below (e.g., Swerve, Pyure Organic Stevia All-Purpose Blend, Lakanto Monkfruit Sugar Substitute, Trim Healthy Mama Sweet Blend). They tend to be much easier to find and taste a bit better than pure erythritol. Click here to see sweetener conversion chart. When substituting erythritol with other sweeteners, you will either need to take out some liquid or add more dry ingredients to the recipe. In general, the sweeter the sweetener you are replacing erythritol with, the more you will have to vary the recipe. Using sweeteners, like Swerve and xylitol, that have only a bit more sweetness may not require any recipe variation other than the sweetener substitution itself. Although it is regarded as safe in doses that are typically consumed, many people are concerned about this artificial sweeteners health effects. In general, animal studies indicate that sucralose can have harmful side effects in high doses, but human studies are still inconclusive and leaning toward it being safe for most people. Fortunately, sucralose is so sweet that it is almost impossible to consume it in the amounts that were harmful to the lab animals. In fact, it is approximately 600 times sweeter than sugar, making it sweeter than any other sweetener that is typically used on keto. We rarely recommend using sucralose in our keto recipes, but when we do, we stick with pure liquid sucralose. The powdered sucralose (i.e., Splenda) comes with trace amounts of carbs (from maltodextrin and dextrose) that can cause an insulin response and impair your ketone production. Pure liquid sucralose has no carb-ridden ingredients so you will be able to get all of the sweetness without diminishing your results. Even though you will only be using small amounts of liquid sucralose, I understand if you would rather just keep it out of your diet altogether. Also, since sucralose is rarely used in most keto recipes, you may find it easier to simply stick to the sweeteners and sweetener blends that are used the most like Swerve, stevia, and stevia/erythritol blends. On the other hand, If you are using stevia drops or pure monk fruit extract to replace the sucralose, you may not have to make any changes to the other ingredients in the recipe. Swerve is a natural sweetener, made from a combination of erythritol and oligosaccharides, that measures cup-for-cup just like sugar. It’s low-calorie, non-glycemic, and an excellent sweetener for keto dieters since it does not affect blood glucose or insulin levels. Swerve is not too sweet and very versatile, so it may quickly become a staple keto-friendly sweetener in your kitchen. We tend to use Swerve in many of our keto recipes as a simple way to add some natural sweetness. When choosing which Swerve product to buy, you will notice that they have both a granular and a confectioners variation. Although the granular looks a lot like sugar, the confectioners will dissolve and mix much better than the granular Swerve product. If needed, you can always put a granular sweetener into a spice (or coffee) grinder and grind it until it becomes a powder. The Swerve substitutes that will work best are the other keto sweetener blends, pure erythritol, and xylitol. However, even these options may change the texture of the recipe a bit because they may not dissolve as well as Swerve confectioners sweetener — unless, of course, you find a powdered version of the granular keto sweeteners mentioned throughout this article. You can also process your granular sweeteners (like erythritol and xylitol) so that they mimic the properties of confectioners Swerve by blending them up in a coffee grinder. *Replacing Swerve with these sweeteners may require you to take out some of the liquid or dry ingredients in the recipe to achieve the right consistency since each one is much sweeter than Swerve. We haven’t even come close to covering all of the keto-friendly sweeteners available today — so what should you do if you have a sweetener that isn’t mentioned above? 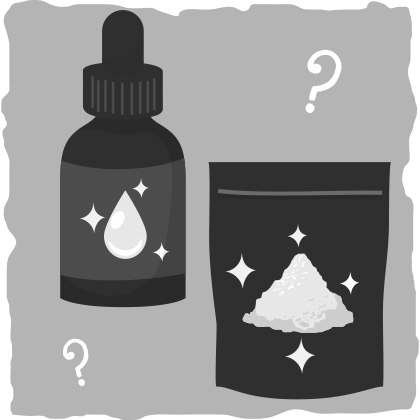 Find the proper dosage of your sweetener that is needed for the recipe. Make the appropriate adjustments to the other ingredients in the recipe if needed. You will find a handful of new low-carb sweeteners that are marketed as being keto-friendly, but the only way to truly know is by calculating the net carbs per serving. 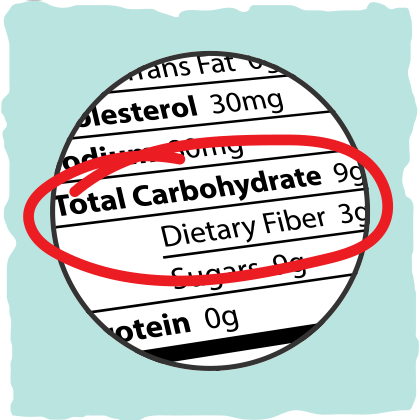 To do this, you will have to subtract the total carbs from the dietary fiber. Keep in mind that some of the sweeteners used don’t get absorbed or processed by the human body, so you can subtract these also. These are sugar alcohols – but some do still have a glycemic response and you should try to be mindful when choosing sweeteners. For a more in-depth example of how to do this, check out our quick post on how to calculate net carbs. Once you’ve figured out how many net carbs there are in each serving of the sweetener in question, you must figure out if it is possible to use it to get the sweetness you need and stay within your net carb limit for the day. For example, if the sweetener you want to use has 5 grams of net carbs per serving, and you need one to two servings to get the right amount of sweetness, then it is best to stick with a sweetener that has little to no carbs at all (like the ones we recommend in this article). To find out how much of your sweetener you would need to use, I suggest looking for their recommendations for using it to replace sugar (or one of the sweeteners in our substitution chart). When you know how much of the sweetener you need to replace a certain amount of sugar, you will be able to add it to this chart and see exactly how much you need to use to replace the other keto sweeteners. Click here to refer the sweetener conversion chart. Now that you know how many servings you need of the sweetener in question, you will be able to calculate how many net carbs it will add to your keto diet. Does the addition of this sweetener cause you to go over your net carb limit? If so, it is best to use it sparingly or cut it out entirely and use the other keto-friendly sweeteners on the chart. If the sweetener you are using does fit into your keto carb limit, then feel free to use it as you would use the other sweeteners, adding the right amount of sweetness and making adjustments to the other ingredients in the recipe when necessary. Other than sugar, there are many other common baking ingredients that you may come across that are far from keto-friendly. The most common are brown sugar, sugar-laden chocolate, and maple syrup. Fortunately, you can easily make or purchase a keto-friendly version of each one. The simplest way to make a low carb version of brown sugar is by mixing one tsp of blackstrap molasses with 1 cup of erythritol (or any other granular keto sweetener you have on hand). However, one tsp of blackstrap molasses has roughly 5 grams of net carbs so make sure you take that into account if you are using this brown sugar replacement strategy. Or you can also buy a keto-friendly brown sugar product like Sukrin Gold. Combine 100% bakers chocolate with a keto sweetener of your choice until desired sweetness level is reached. * To attain around the same level of sweetness of a milk chocolate bar, add the keto-friendly sweetener equivalent of 4 tablespoons of sugar to 50 grams of 100% bakers chocolate. Buy chocolate products that only use keto-friendly sweeteners. ChocoPerfection and Lilys Chocolate are some of our favorite keto-friendly chocolate brands. *When making your own keto-friendly chocolate, you may want to avoid using pure stevia as your only sweetener as it may make the chocolate more bitter. You may also find the chocolate tastes better if you powder the granular sweetener first. Make your own by following our keto maple syrup recipe. Use a keto-friendly maple syrup product like Walden Farms Pancake Syrup. Add maple extract to recipes that need that extra maple flavor. Although it is best to stick to the sweeteners that are used in the recipe you are following, you probably won’t have every keto sweetener that we recommend. Fortunately, you can follow a few simple rules and use some basic math to figure out how to use almost any low carb sweetener you’d like. Make sure the sweetener you are using is actually keto-friendly by calculating the net carb per serving and the number of servings that you will be using. Use our sweetener conversion chart to help you add the right amount of sweetness to your recipe. When using a concentrated sweetener instead of a granular sweetener: you will need to subtract some liquid or add more dry ingredients (e.g., a keto flour like almond or coconut) until you get the right consistency. 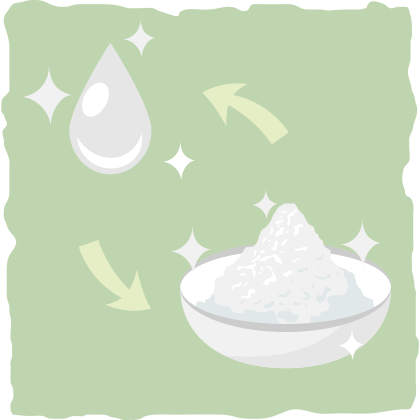 When using a granular sweetener instead of a concentrated sweetener: for every 1 cup of granular sweetener, add roughly 1/4 cup of liquid to the recipe slowly until you reach the right consistency. That’s it — it is that simple, but it may not be easy due to the different properties that each sweetener has. However, with some experimentation, you will eventually be able to use whatever sweetener you have available without any issue. For more information on sweeteners for the keto diet, check out our guide to the best and worst low carb sweeteners.